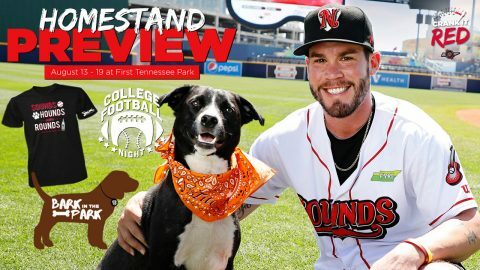 Nashville, TN – The Nashville Sounds Baseball Club returns to First Tennessee Park for a seven-game homestand on Monday, August 13th, 2018. The week-long stay at First Tennessee Park is the penultimate homestand of the 2018 season. The Sounds welcome the Round Rock Express, the Triple-A affiliate of the Texas Rangers, for a four-game series from August 13th-16th before hosting the New Orleans Baby Cakes, the Triple-A affiliate of the Miami Marlins, for a three-game series from August 17th-19th. Kroger Plus Monday – Buy a “Family 4-Pack” that includes 4 Select section tickets, 4 hot dogs & 4 fountain sodas for $44.00 when fans show their Kroger Plus card at the Sounds Ticket Office. 7:05pm | Gates open at 6:00pm. Taco Tuesday Night presented by Estrella Jalisco – For the first and only time in 2018, it’s taco night at First Tennessee Park. Fans can enjoy a pre-game all-you-can-eat, build-your-own taco bar in the Pepsi Pavilion. The $40.00 package includes a Reserved section ticket, taco buffet access and unlimited Estrella Jalisco and Bud Light draft beer. Advanced Purchase Required. Takeover Tuesday with the Nashville Predators presented by Pepsi. Wear It Wednesday Sounds, Hounds and Rounds T-Shirt Giveaway to the first 2,000 fans (21 & older) presented by Tito’s Handmade Vodka. Bark in the Park Night #2 presented by Tito’s Handmade Vodka – tickets start at $14.00 ($9.00 for human, $5.00 for dog). All dog ticket proceeds benefit New Leash on Life. All dogs and owners must enter through the right field entrance at First Tennessee Park. Advanced Purchase Required. College Football Night – Fans can buy a ticket and receive a free Sounds hat with their school’s colors. The ticket and hat bundle start at $18.00 and includes the University of Tennessee, Vanderbilt University, Middle Tennessee State University, University of Alabama, University of Kentucky, University of Florida, Louisiana State University, University of Arkansas, Mississippi State University and Texas A&M University. Advanced Purchase Required. Throwback Thursday presented by Budweiser – the Sounds will wear throwback uniforms to commemorate the team’s original uniform style from 1978. Fans can purchase Pepsi fountain soda and Budweiser products at a discounted rate. FOX 17 News post-game fireworks presented by Koorsen Fire & Security. Enjoy Saturday at the Park with visits to The Band Box and our Family Fun Zone in the right field corner. Yoga on the Diamond presented by Lululemon Nashville, Small World Yoga, and Nashville Fit Magazine. Tickets cover both yoga and the game, with a portion of the ticket being donated to Small World Yoga. Yoga registration begins at 8:30am with the yoga class following from 9:00am-10:00am. Hyundai pre-game autograph session with select Sounds players from 5:15pm to 5:30pm. Military Sunday Family Fun Day – The Sounds extend their military appreciation by wearing special military jerseys on the field and offering discounted reserved section tickets for active and veteran men, women and families – subject to availability. Post-Game Kids Run the Bases (12 & under) presented by First Tennessee. Seniors and Military families can enjoy a $2.00 discount on single game ticket prices at First Tennessee Park. The offer is valid for any reserved seat section on Sunday through Wednesday games – subject to availability. Offer valid for up to four (4) tickets per I.D. (Seniors 55 +, government issued military I.D. required at box office; no phone orders). The Nashville Sounds’ media partners for weekly promotions include Nash FM 103.3, 104.5 The Zone, 96.3 JACK-fm, iHeartRadio, FOX 17 News, and WSMV-TV Channel 4.